The Kiebach Center’s Africa Business Program at the Martin J. Whitman School of Management will host the 7th Annual Conference on Africa Business and Entrepreneurship May 19-21 at the Whitman School. 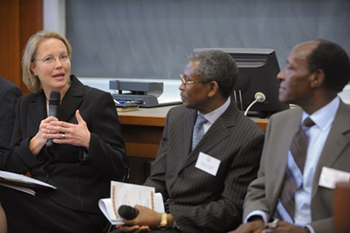 Onondaga County Executive Joanne Mahoney speaks at a previous Africa Business Conference. The conference offers a unique forum for participants to meet and discuss their current work on business and entrepreneurship in Africa with other academic researchers and business professionals from around the world. Through paper presentations, panel discussions and keynote addresses, participants seek to understand the pivotal role of entrepreneurship in Africa’s economic development. Participants from around the world will present their findings and offer diverse perspectives on Africa’s budding marketplace. The conference agenda begins with the Africa Business Forum, targeted primarily toward area businesses, with the participation of the U.S. Department of Commerce, SAAB-Sensis and the Central New York International Business Alliance. It continues with paper presentations by faculty from many countries. The mission of Whitman’s Africa Business Program is to facilitate partnerships between businesses in Central New York and countries in Africa, enhance the business community’s readiness for entering into business relationships with Africa, promote faculty research and interest in business in Africa and increase Africa-related knowledge among students. Made possible by a two-year grant from the U.S. Department of Education’s International Business and Education program, Whitman’s Africa Business Program is the joint responsibility of the Kiebach Center for International Business Studies, the Central New York Technology Development Organization and the Central New York International Business Alliance, and is also supported by the County of Onondaga Division of Economic Development, the U.S. Department of Commerce, the New York Empire State Development and the Greater Syracuse Chamber of Commerce.